Audiophiles know that minute changes in one’s stereo system (such as adjusting cartridge VTA, speaker positioning, or tube selection) can have dramatic effects on sonic performance. They can mean the difference between creating the illusion of bringing performers into the listening space or just playing tunes. But what types of system tweaks and adjustments lead to the creation of reference-quality recordings with breathtaking transparency, seemingly perfect tonal balance, and beautiful timbre? For Ed Pong at UltraAnalogue Recordings (ultraanaloguerecordings.com), they start at the very beginning of the recording process—the instruments themselves—and extend throughout the chain. If you’ve ever wondered what all the fuss has been about the sound of either a Stradivarius or a Guarneri del Gesù violin, you must listen to these mastertape dubs. Pong’s goal is to capture and reproduce the sound of the performance as closely as possible. These chamber music recordings are some of the best quarter-inch, two-track, 15ips tapes I’ve heard. Whether or not you have a reel-to-reel deck or plan to purchase one, UltraAnalogue’s “purist” formula for creating great recordings is illuminating. It always excites me to find a rich source of recordings that marry great performances with first-rate sound. Regrettably, I have too many audiophile releases gathering dust, because the music is not up to the level of the excellent recordings. When shelling out anywhere from $125 to $525 for tapes per title, or $250 for an UltraAnalogue release, you want to make sure the performances are worth the expense. Although many of the young performers Ed Pong uses for his recordings are relatively unknown on these shores, they play with a musical maturity and technical mastery that belie their ages, and several are already stars in Asia or Europe. Just as the catalogue for UltraAnalogue continues to grow, the number of R2R tapes in general keeps increasing, with a wide spectrum of tapes from a variety of sources. Jonathan Valin provided an excellent “reelography” along with his insightful review of the UHA-HQ Phase 11 deck in TAS 234. There is also a helpful listing of URLs for reel-to-reel master tape copies on the United Home Audio website (unitedhomeaudio.com). According to UHA’s Greg Beron, the number of high-quality quarter-inch, 15ips, two-track, first-generation dubs of mastertapes or of safety masters now exceeds 450. One of the first and best sources of dubbed mastertapes is The Tape Project’s collection of classical, jazz, and pop. 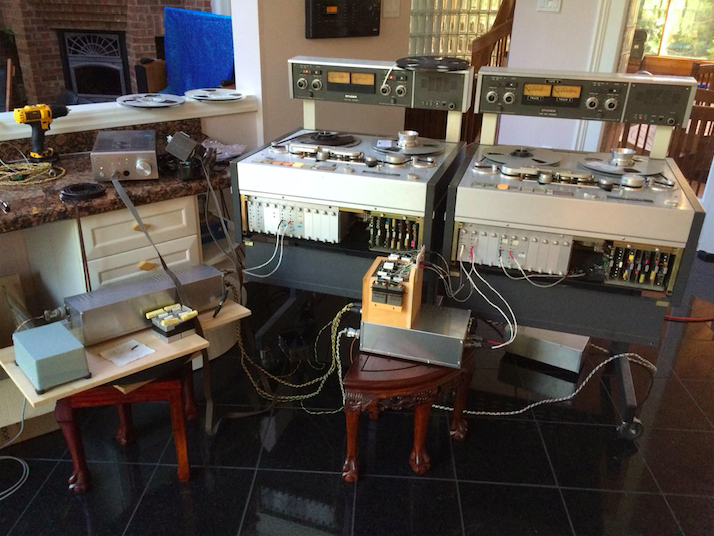 These have been joined by 50 reel-to-reel recordings from the Swedish audiophile label Opus 3. In other activity, Yarlung plans to release four new Sonorus series tapes in early 2017, including James Matheson’s String Quartet as well as his Times Alone song cycle, and two volumes with performances by the Sibelius Piano Trio. Horch House has recently introduced several Star Wars soundtracks, as well as Carmina Burana, The Reiner Sound, and Gustav Holst’s The Planets. Jonathan Horwich of International Phonograph offers a number of superb jazz recordings. Perhaps the most highly anticipated new releases are Acoustic Sounds’ initial “Ultra Tape” series with a dozen announced titles thus far, including Ben Webster’s Gentle Ben, Janis Ian’s Breaking Silence, and the famous RCA Reiner recordings of Rimsky-Korsakov’s Scheherazade, and Respighi’s Pines of Rome and Fountains of Rome. More good news: thanks to the open-reel evangelism of people like Greg Beron and TAS’ own Jonathan Valin, as well as the exposure of audiophiles to the playback of dubbed mastertapes at audio shows, there has been a modest influx of new and refurbished R2R decks. Horch House’s upcoming Project R2R deck in collaboration with Revox is claimed to be the first new reel-to-reel machine design in decades. Continuing to evolve his highly-regarded UHA-HQ series tape decks, Greg Beron has just introduced the UHA Ultima One, which goes beyond the wonderful UHA Phase 12 that I am currently using. Additionally, Jeff Jacobs at J-Corder offers a variety of relatively affordable and highly reliable Technics deck restorations and modifications, and one can purchase used pro and prosumer decks with the right specs to play back these amazing tapes. Ed Pong formed UltraAnalogue Recordings to “record chamber music, in a natural acoustic, with custom tube electronics and analog tape.” His intent is to bring listeners closer to the live musical event and the raw emotion in the music. He records in a rectangular room that’s 40 feet by 50 feet with a sloping ceiling that’s 25 feet high at one end and 12 feet high at the other. The side walls and ceilings are lined with cedar wood. As with many of the greatest recordings, Ed Pong uses only two microphones, a pair of Royer R-122v tube ribbon microphones with special silver interconnects. They are spaced about three feet apart and are generally at a height of seven-and-a-half feet when a violinist is standing. The distance from the microphones to the violinist is approximately eight feet and at least ten feet from the piano. Since no mixer is used, Ed relies on the artists to achieve the proper balance between the instruments, which places extra demands on the artists. Before recording, he also makes sure there is the right mix between direct and reflected sound, and it typically takes from one to two hours for him to find the “sweet” spot. Ed also keeps the signal path as simple and direct as possible. You won’t find any signal processing, mixing, or added reverb on these recordings, and perhaps more importantly, each movement is recorded in one take, creating a “live-in-the-studio” performance. To capture as much fine detail as possible, silver wiring and silver-wound transformers are used exclusively throughout the entire recording chain. 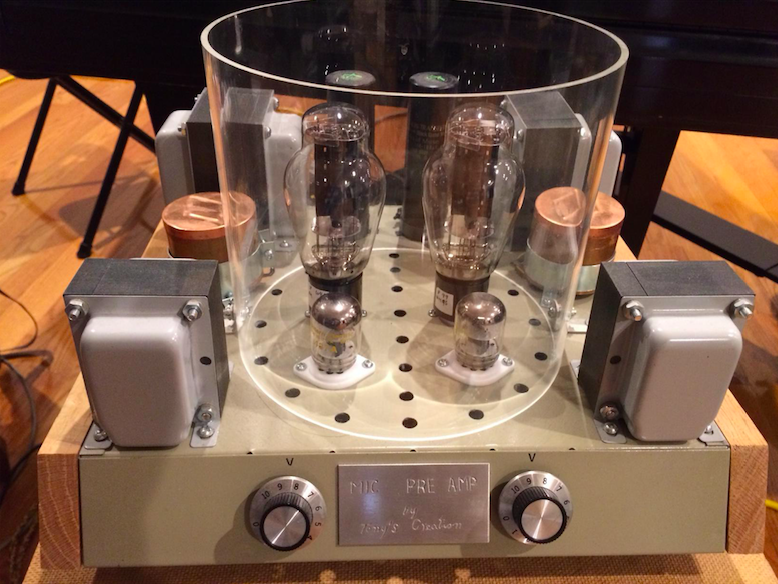 Like many audiophiles, Ed believes that Western Electric tubes present the most natural and beautiful timbre throughout the audio range. Consequently, he uses a custom-designed microphone preamplifier with a triode WE300B output tube and a WE437A input tube. An interstage transformer obviates the need for capacitors in the signal path. To create the most realistic dynamic range and the best signal/noise ratio possible, Ed records on RMG SM900 tape at +4 dB above 250 nWb/m. In contrast, the Tape Project uses a 250 nWb/m level, but if your tape deck does not have an adjustable output stage he can run tapes at the lower level. As a convenience, each UltraAnalogue tape begins with a 25-second track of a 1kHz tone so you can set the output level of your tape deck to show 0 VU. I suspect this higher level is one of the reasons the UltraAnalogue tapes are so dynamic and lifelike. As a dedicated audiophile, Ed Pong knows that to reproduce great sound everything matters, from the microphones to the electronics. Much like United Home Audio’s Greg Beron with his UHA-HQ decks, Ed is constantly improving his recording and tape-transfer chains; however, as a violin maker, Ed starts first with the instruments before they are put in front of the microphones. He knows that, because they’re made of wood, the exquisite instruments he records—highly-prized violins, cellos, and pianos—vary in sound quality with temperature and humidity. His recordings of stringed instruments start at the lutheir’s shop (George Heinl & Company) to tailor the violin or cello to the sound Ed wants to project in the recording. 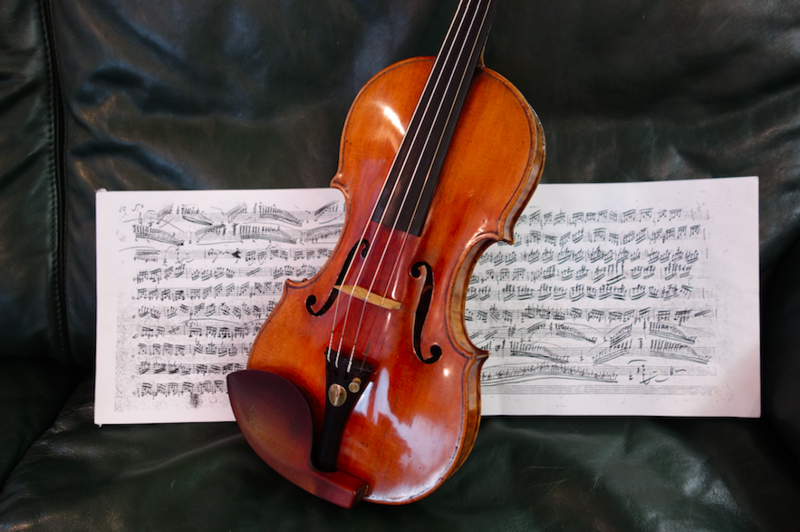 For example, to enhance its natural timbre and to avoid harsh or bright sounds, Ed uses Oliv gut strings on the 1738 “ex-William Kroll” Guarneri del Gesù violin Taksuki Narita plays. He also reshaped the bass bar in the restoration of Taksuki’s Guarnerius to open up the sound. His seven-and-a-half foot Steinway B piano has softer German Hamburg hammers to “create more color,” and all of the bass strings have been changed to create better pitch definition. UltraAnalogue Recordings’ strategy is to find young artists at the brink of worldwide stardom, and many have already earned prestigious awards. For example, violinist Xiang Yu won the Yehudi Menuhin International Violin Competition in 2010 as well as its Bach and Audience Prizes. Pianist Yun-Yang Lee topped the 2nd Carl Czerny International Piano Competition as well as several other international and regional competitions. 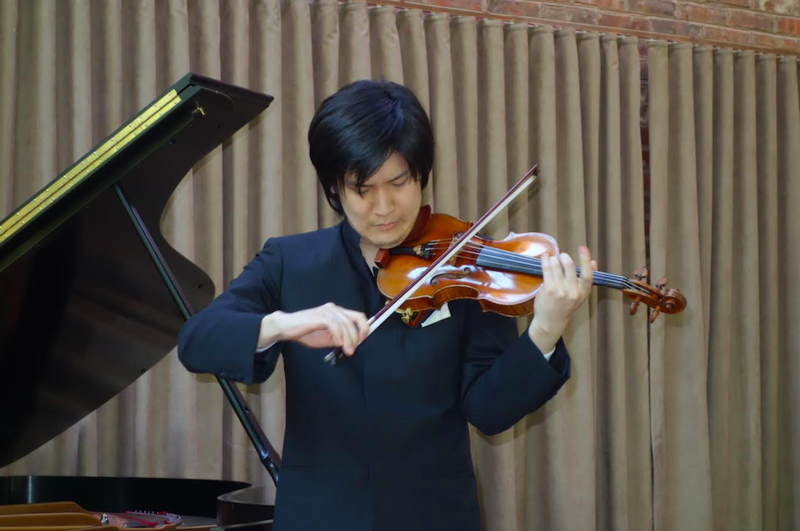 Violinist Tatsuki Narita placed second in the Queen Elizabeth Violin Competition in 2012 and won the Ysaye Prize. UltraAnalogue Recordings currently boasts a catalog of 41 tapes, and I have auditioned many of them. All of those performances are quite impressive and the recording quality is excellent. For example, pianist Yun-Yang Lee’s performances of Beethoven’s Waldstein Sonata and Liszt’s Rigoleto Paraphrase, works I have also performed, left me in awe. I have highlighted a few of the latest recordings below that use Ed Pong’s most recent electronics and tweaks. These have the best transparency, soundstage depth, resolution, and natural instrument timbre of any UltraAnalogue Recordings, and that’s saying something! Please note that Ed will rerun customers’ “earlier” tapes through his current system at a modest charge. Beethoven: Violin Sonata No. 3, Op. 12 No. 3; Ravel: Tzigane. Xiang Yu, violin; Yun-Yang Lee, piano. Written by the composer in 1798 and dedicated to Antonio Salieri (perhaps forever unjustly vilified by Peter Shaffer in his play Amadeus), this sonata is in three movements. The first movement, Allegro con spirito, requires a lot of energy and clean technique, and here both performers are more than up to the task. The balance and synergy between the performers are exceptional and Ed Pong doesn’t spotlight one over the other. As a pianist, I paid close attention to Yun-Yang, and his piano “accompaniment” is phenomenal (yet it never overshadows the violin). The Adagio requires a beautiful singing tone from both performers, and the tonal purity and harmonic richness of Xiang Yu’s 1729 Stradivarius violin as reproduced on the recording are exquisite. In the final movement, a rondo, the interplay between the violin and piano is riveting, and the sound comes as close to putting the performers in the room as you’re likely to ever hear on a recording. I was struck by the wide dynamic range and startling dynamic contrasts, making the performance even more thrilling. The reel concludes with Ravel’s Tzigane for violin and piano, which begins with solo violin playing a haunting gypsy melody and later adds some very intricate piano accompaniment. Tzigane reminds me of Liszt’s Fantasia on Hungarian Folk Melodies, with a soulful, evolving rhapsody ending in a frenetic conclusion. Xiang Yu’s technical mastery and intonation are superb throughout the difficult harmonic gymnastics, and Yun-Yang’s piano accompaniment is sublime. Tzigane is a vigorous and colorful encore to this terrific reel. Paganini: 24 Caprices, Op. 1. Tatsuki Narita, violin. Paganini: Caprices Live in Concert, November 26, 2016. Tatsuki Narita, violin. The most recent recordings from UltraAnalogue are the 24 Caprices for Solo Violin by Niccolo Paganini. These are similar to Chopin’s Études for piano in that each presents different technical demands, such as trills, arpeggios, octaves, and thirds (or in the case of Chopin, double-thirds). The best artists, like Tatsuki Narita, are able to meet these formidable challenges while bringing out the inherent musicality in each. There is no doubt about Tatsuki’s technical prowess, but he also displays a mature musicality that’s uncommon for such a young artist, making the Caprices sound like musical works rather than technical studies. The studio recordings come in three reels (Caprices Nos. 1–8, 9–18, and 19–24), and one can purchase them individually or as a set. The sound is immediate, palpable, and amazingly transparent. Tatsuki plays a 1738 Guarneri “del Gesù” violin (Paganini also performed with a Guarnerius) with gut Oliv strings that sounds amazingly lifelike, with devastatingly beautiful timbre. Sonically the concert recording suffers slightly in comparison with its studio counterpart, although it’s still quite transparent and natural-sounding. The playing on the studio recordings is somewhat more refined, with better intonation; however, there’s more raw energy and risk-taking in the live concert. It’s like watching a racecar driver negotiating hairpin turns on the edge of a cliff without a guardrail. You keep expecting Tatsuki to crash and burn, or at the very least to break down, but he escapes unscathed. I was mesmerized by his combination of technique and musicality. Both the live and studio performances are compelling, but overall the studio tapes get my nod with their superior sound and more refined technique. Schubert: Grand Fantasie in C Major D. 934; Saint-Saëns: The Swan. Xiang Yu, violin; Yun-Yang Lee, piano. Written in the last year of the composer’s life and shortly after he finished the final 12 songs of his famous Winterreise, this Schubert Grand Fantasie is one of his most uplifting and melodic works, including a lovely theme and variations with wonderful interplay between the violin and piano. It’s as if the violin is a vocalist singing with piano accompaniment, and Xiang Yu lets the melodies soar, aided by the beautiful reproduction of the rich timbre of his 1729 Stradivarius. The piano, brilliantly yet subtly played by Yun-Yang, is a perfect complement, and it’s as if the performers breathe together. Like others in this latest batch of UltraAnalogue tapes, this reel has outstanding transparency, tonal balance, and explosive dynamics. The piano is perfectly balanced, with a solid bass foundation and delicate highs. The reel concludes with The Swan, one of the most famous of Saint-Saëns’ compositions. If you attend violin recitals, you’ve undoubtedly heard it played, but not this delicately or ethereally. It’s almost as if the violin never takes a breath. If you want your system to transport you to the recording venue, or into a dream-like state, listen to this recording.